Columbus’ voyages to the "New World" were just the beginning of the intermingling of peoples and cultures that formed our Nation; this rich and varied history is reflected in the prehistoric and historic sites, buildings, structures, objects and districts found throughout the land. The National Register of Historic Places can guide you through our history with Discover Our Shared Heritage--a series of travel itineraries that explore our country’s past through visiting historic places which reflect major aspects of American history, such as exploration and settlement and cultural diversity. The first explorers and settlers of Texas were American Indians; they gave the vast place its name and learned how to live in its climate and geography. Some of the earliest and most expansive attempts at colonizing were made by the Spanish. Texas, the “Lone Star State,” was the only state to enter the Union by treaty as an independent nation. Its name derives from the Spanish rendition of the Caddoan Indian word tejas, meaning “friend.” Spanish seafaring explorers encountered the territory that was to become Texas in the 16th century, irrevocably altering life for the American Indians who lived there. European settlement and encroachment into Indian lands displaced the Caddos, Coahuiltecans, Apaches and Comanches, who were forced westward. Some native groups disappeared entirely. Once a province of Spain, and later part of the Mexican Empire, Texas boasts a history of European settlement that spans four centuries. There were more than 90 expeditions into the region called “New Spain” by the early 18th century, and by 1731, a dozen Spanish missions, protected by presidios (forts) had been established. Eventually, Spanish immigrants began to settle on land occupied by the missions. In the early 19th century, upon Spanish invitation, Anglo-Americans began to settle Texas, which later caused hostilities with the Mexican government. 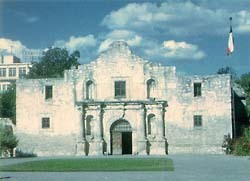 After a series of battles, including those at the Alamo and San Jacinto, Texas established itself as an independent nation. Texas remained independent until it became a state in 1845, which Mexico regarded as a declaration of war by the United States. The earliest battles of the Mexican War were fought on what is now Texas soil. In 1861, Texas, a slave state, joined the Confederacy. Just before the close of the Civil War, settlement had begun to expand throughout south, east and southwest Texas, and the Indian people were forced out of their native territories. This territorial expansion caused hostilities between the natives and the settlers that were eventually checked by the establishment of military outposts along Texas’ western frontier. By the turn of the century, the construction of railroads had further expanded settlement of the state. Today, Texas is a blend of Hispanic, American Indian, Asian, Anglo and European cultures, reflecting the state’s rich history of exploration and settlement. The major themes highlighted in this itinerary are: encounters between European explorers and American Indians, development of the Spanish Mission system, Spanish and Mexican settlement, the Texas independence movement, and the impact of European immigration. Our tour of historic places in southern Texas extends through the western frontier. This National Register of Historic Places Travel Itinerary links National Parks with places listed in the National Register that illustrate early periods of Texas history. The 50 historic places highlighted in this itinerary can teach us about the contributions of the various people who settled in what became the United States of America. The itinerary includes a map showing the location of these historic places along with a brief description of their importance in our Nation’s past. The online version of this itinerary also includes six historic places in Galveston, not included in the previously printed version because of space limitations. Use this guide for locating interesting historic places in conjunction with your travel to South and West Texas. Visitors may be interested in Historic Hotels of America, a program of the National Trust for Historic Preservation, located in Texas, including the Fairmont Hotel, the Menger Hotel and the Riverwalk Vista in San Antonio, The Tremont House and the Hotel Galveston in Galveston.